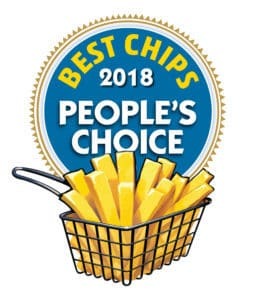 Home > News > Latest News > Mr Chips Masterton voted People’s Choice Best Chips for second year running! Mr Chips Masterton voted People’s Choice Best Chips for second year running! Who cooks NZ’s best chips? 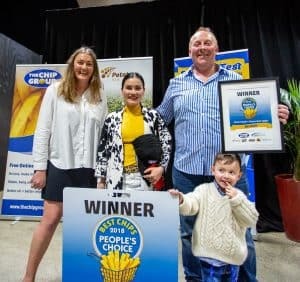 This year the people of NZ put their favourite chippie forward and voted for the 2018 People’s Choice Best Chips…and the winner – Mr Chips Masterton. Continuing their winning streak from 2017, Mr Chips Masterton beat out over 500 chip shops to be named reigning champion of the 2018 People’s Choice Best Chips – taking the award for the second year running! The award was announced at the inaugural Chip Fest in central Auckland on Thursday 20th September – an industry event for media, industry and hot-chip lovers celebrating all things deep fried chips. A list of the Top 15 ‘Finalists’ were also announced. With over 3000 votes cast it is clear New Zealanders are fiercely passionate about who they think cooks the best chips. The competition was organised by The Chip Group (a division of Potatoes New Zealand Inc.) and supported by Bidfood Limited, along with McCains, Mr Chips and Talleys. Free voting took place via The Chip Group’s website and it was open to any business that cooks and sells hot chips in New Zealand. To be eligible to win, at least one staff member must have completed The Chip Group’s Best Practice Frying training in 2018 – a free online course covering how to cook chips with less fat and sodium (salt). The winner received a range of prizes including flights and accommodation to attend Chip Fest in Auckland, an Air NZ Mystery Weekend, $500 grocery voucher, framed certificate, aprons, caps and a footpath sign along with several cartons of free chips and of course the invaluable 2018 title. The Chip Fest event included stalls from chip suppliers – Mr Chips, Talleys, McCains and food distributor – Bidfood Limited, who supported the competition. “Bidfood are proud to support People’s Choice Best Chip Shop competition; celebrating excellence in the art of ‘chippery’. We see the people’s choice award as an integral part, because we understand first-hand how nice it is to have accolades on the wall. People’s Choice truly is the judgement of your customers, as such it is the defining call of success.” – Dan Parsons, Head of Marketing, Bidfood Limited.